The Second Judicial District Commission on Judicial Performance, on a vote of 10-0, recommends that Judge Clarisse Gonzales Mangnall, BE RETAINED. Judge Gonzales Mangnall was appointed to the Denver County Court bench in January 2007. Judge Gonzales Mangnall earned her undergraduate degree in visual arts from the University of Northern Colorado in 1987 and her law degree from Howard University School of Law in 1992. Before becoming a judge, Judge Gonzales Mangnall worked as a prosecutor, as both a court-appointed and private criminal defense lawyer, and as a guardian ad litem in dependency and neglect cases. Judge Gonzales Mangnall also served as a district court magistrate in the Eighteenth Judicial District from 2005-2007. Judge Gonzales Mangnall currently serves on the board of the Girls Athletic Leadership School which is a charter school within the Denver Public Schools. Judge Gonzales Mangnall previously presided in the municipal criminal division and currently presides over a traffic courtroom. The Commission reviewed the survey results of lawyers and non-lawyers who have appeared in Judge Gonzales Mangnall’s court, interviewed the judge, and reviewed one written opinion, two oral opinions and her self-evaluation. Selected members of the Commission observed Judge Gonzales Mangnall in court. Of attorneys responding to the survey, 93% recommended retention, 7% recommended against retention, and 1% expressed no opinion. Of non-attorneys responding to the survey, 77% recommended retention, 11% recommended against retention, and 13% expressed no opinion. Judge Gonzales Mangnall’s survey results revealed an overall combined average rating well above that of the combined rating of all county judges standing for retention. 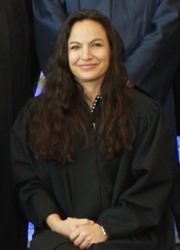 The Commission is impressed with the extremely high number of survey recipients who reported Judge Gonzales Mangnall to be completely neutral in proceedings and with her high achievements in all five areas of review among attorneys: case management, application and knowledge of the law, communication, demeanor, and diligence. The Commission has some concerns over some negative survey comments related to her time management, but many of those comments relate to Judge Gonzales Mangnall listening too much and allowing parties to present their case. Echoing her last retention review by this Commission, Judge Gonzales Mangnall’s strong ratings in the areas of case management, application and knowledge of the law, demeanor, and diligence are a testament to her judicial abilities.